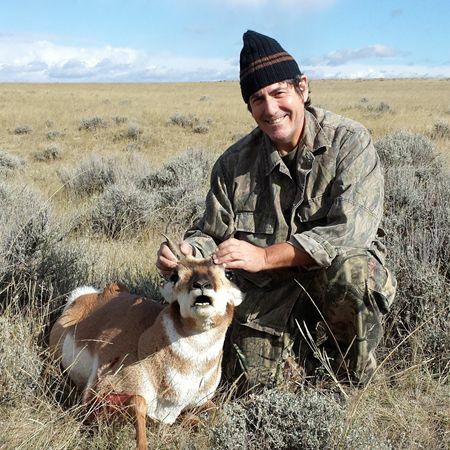 We needed a first big game hunt for the boys, and after pondering the situation I came up with the idea of an antelope hunt in Wyoming. I had hunted a ranch several years before and still had the contact information. 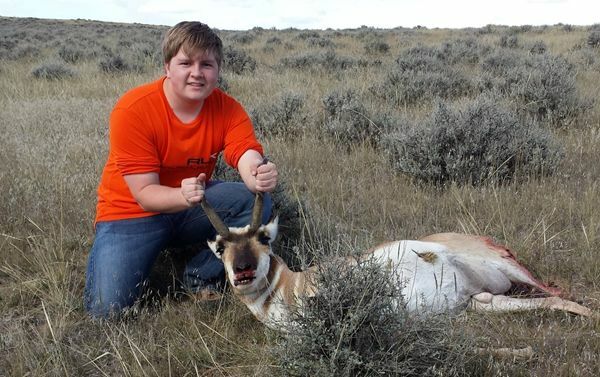 After flailing around with the logistics of when the boys were out of school and when the adults had to get back to work, I contacted Marty at the ranch and reserved a spot for six for the second weekend of antelope season. Through a convoluted series of events, the plan was for four of us to fly from Phoenix to Denver, drive to Casper, overnight it at a hotel, meet with the other two driving from Spokane, then drive to the ranch the next day. I must take the moment to whine about the relatively recent change in airline baggage policy. It appears that almost all airlines now have around a $200 per leg charge for oversize baggage – like a rifle case. Hmmm, $150 plane ticket with $400 of baggage charges just doesn’t seem right. `Nuff said. The plan actually came together without major incident, and all six of us arrived at the ranch at the appointed hour. It started to drizzle and the wind picked up to gusts of 20 mph just as the weather report said it would. As the boys scurried around to get their gear together, don the orange and jackets etc., a tall lean ranch hand sauntered up. It was Marty. He had arranged for himself and another ranch hand, Tim, to guide us. After a bit of discussion, we decided to have Doyle and his son Bailey (from Spokane) go with Marty, while the rest of us went with Tim. Sheesh. My eyes aren’t the greatest, but this guy was giving me a complex. And the funny thing is, after sneaking up on them, Tim was right. Always. Tim was driving a white crew cab pickup, and the basic arrangement was one person in the passenger seat (who was the primary shooter), two in the back cab (moral support and spotting), and optionally one riding on the hay bale in the back (spotter) or in the back of the cab with the other two. Nobody wanted to be first up, so Jim and his son Jamison as well as my nephew all squeezed into the back cab while I jumped into the front passenger seat. As we drove off, the rainy drizzle stopped and the wind died down a bit. A good omen. A quick word on the hardware our little group carried. Jim had a semi-auto .30-06 with several 4 round magazines. Jamison had a lever action 30-06, and Matthew a single shot break open .30-06. I however, had an axe to grind. I had carried this particular rifle on 3 hunts without ever taking a serious shot. The first was an elk hunt (only saw deer), the second a deer hunt (only saw a cow elk), and the third an out of desperation shot at a javelina (what the heck, at a running javelina over 200 yards away). I was blasting something this time dammit! And the caliber of my cannon: .338 RUM. After driving a spell, and laughing at a couple of Wyoming type jokes, Tim spotted the herd that prompted the conversation above. I’ve always wanted an atypical rack, so I told Tim I’d try to take the last antelope with the goofy horn. We drove a bit more, got out, and started a bit of a stalk. Given the entire herd was watching us from the side of the hill they were on, I quickly surmised the stalk wouldn’t go much further. As I started to set up my shooting sticks, Jim mentioned he’d back me up if I missed. Fair enough. As I was setting up, the herd looked like it wasn’t going to stay around much longer. I had left my rangefinder in the truck, and asked my esteemed colleagues what the range was. I will be the first to admit that I am terrible at judging distances, and a rangefinder is a must for me at any appreciable distance. Funny thing about antelope and Wyoming though, I’ve never had good results with rangefinders there – I’ve never found one that reads reliably past 350 yards. I don’t know why, but I suspect there’s something about the antelope coat and sage brush just doesn’t seem to reflect a laser very well. Anyway, I heard, “425”. That was okay for me; I’m max point blank out to about 350 so 425 is not much of a hold over. Goofy horn paused broadside a moment, I put the cross hairs right on the top of the shoulder and let it fly. Yep, cleared the shoulder by about 6 inches. Hmm. I heard Jim shoot a few times immediately afterward and old goofy horn just kept on running. Sure enough, in the opposite direction was a solitary antelope buck standing in the middle of an empty field. The rangefinder said 250. This was good news because I had Jim and Jamison practice on a rock at 260 at the Table Mesa Road spot. Jamison quickly set up on the sticks and pulled the trigger. It was a good shot. In fact, it worked out to be the best shot of the bunch. Right behind the shoulder and right about the midline. The antelope walked about 10 yards and fell over dead. A quick jaunt in the truck, and we set upon the downed antelope. Jamison had field dressed his first game animal (a javelina) a few months prior, and it was time to scale up a little bit. With a bit of encouragement, pointing, and lots of grunting from the sidelines, he managed to get the field dressing done and the antelope into the back of the pickup. A bit more driving, and we were on another herd. This time, the herd ran around the hill to our right. We stopped and started a stalk. What we found was a deep bowl on the other side of the hill with a riser almost as high as the hill. No antelope. We decided to drop down into the bowl, go up the other side, and see what we could see. After a few words of wisdom about not silhouetting one’s self to the boys, we were off. As we peeked over the top of the bowl, we saw a herd of about 30 spread out on the next hill at about 200 yards (yes, using the rangefinder). My nephew was to my right, and Jim and Jamison were about 10 yards to his right. It was steep enough, so I told my nephew to rest his rifle on top of the berm in front of us and take the straggling antelope near the bottom of the hill on the left. He was taking too much time, and as I turned to look at him and tell him to shoot, I heard Jim rack the action on his semi auto…. All the antelope also heard him rack his action and took off running. Looking further over, Jim had forgotten about silhouetting himself as well and was just blazing away. Pancho Villa was born. Continuing on, we searched the prairies for more antelope. Several herds were spotted, but they were either too far away, or ran before we could get within reasonable range to start a stalk. As we rounded a corner two antelope were standing on the “road”. They took off around the back side of the hill to the right, and we jumped out of the truck. We lined up, more or less, and headed up the hill. Jim and Matthew were to my left, and Jamison to my right. As we crouched and made it to the crest of the hill, I saw nothing — for miles in all directions. As I was standing up a bit more, Jamison started pointing down the hill and a bit to my left. I saw the tops of two sets of horns, and as I finished standing up a bit more, the antelope saw me as I saw them. They were indeed on the bottom of the same hill we were on. Seeing me, they did as antelope do – run! They ran back to the left, basically whence they came and were quickly out of my sight. That meant they were headed into Pancho’s and Matthew’s view. I started running along the top of the hill to my left, and as I made it near Matthew, I heard Jim shooting. By his third round I could see the two antelope on the side of yet another hill. They weren’t running full speed any more, but were more than walking. As I thrust my shooting sticks to the ground, I had to guess they were at a bit over 400 yards. No time for a range finder. Jim had gone silent, and I presumed he was slamming another magazine into his rifle. I drew a bead on the antelope on the left, guessed its speed, aimed forward and high and pulled the trigger. Ka-Boom! The .338 RUM is not subtle. I looked at that far hill, and only saw the antelope on the right; it was running away over the hill as Pancho blazed away another 4 round magazine. Jamison walked up to me and said, “Man, yours just face planted!” I was worried about meat loss with the cannon, but at that range and on the move frankly I was happy and surprised I hit it. Sheesh. As the antelope continued to flop around I noticed something else. There was no blood anywhere! As I kept looking I finally noticed that there was a .338 caliber hole through the right horn about 1” above the skull and the horn was hanging by a thread. Holy moly! Evidently I had shot it through the horn and brain damaged it to such a degree that it wasn’t getting up again. I took the 30-06 from Matthew, and one more shot to the cortex ensured it wasn’t going to flop around anymore either. I took a moment to give thanks for the kill and then proceeded to get the field dressing done. Two down and two to go. More driving and spotting. Again, in a bit of strangeness, we rounded a corner and there were two decent size adult males fighting - it was the rut after all. As the truck did a mini power slide to a stop, I ranged them at 49.7 yards. Wow! Jim scrambled out of one side of the truck, and Matthew the other. Matthew was just a bit slow, and as he was setting up his shooting sticks (wrong move at 50 yards) Jim used the corner of the truck and blazed away. 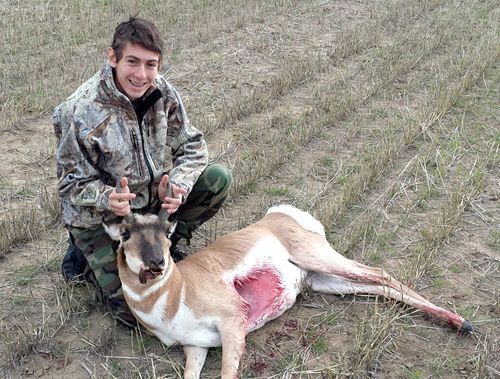 His first shot hit the antelope on the left, and as they broke away and ran, his fourth shot hit it again. So much for letting the boys get the first shot…. Anyway, we had another antelope down and the field dressing commenced. Jim doesn’t have a whole lot of experience field dressing, so it took him a few minutes with some pointers from us bystanders. While we were doing this, the cattle came in to take a closer look, as did a couple of antelope. They were yearlings and not candidates for the BBQ, so we just watched to see how close in they would come before they realized we were disemboweling one of their cohorts. About 10 yards. By this time, I was getting the idea that Matthew wasn’t very excited about having to field dress an antelope. Three down, and one to go. About a mile of driving later, we spotted two males and a yearling relatively near the road on a flat. Further down the road was an oil maintenance shack, so we drove to that. Funny thing about driving a truck around the prairie in Wyoming; if it’s white the antelope assume it’s an oil worker truck and don’t pay much attention to it. So we drove past the antelope to the oil maintenance shack as any good oil worker would do, and they barely lifted their heads to acknowledge our passing. After we parked, I grabbed my rifle and rangefinder and moved to the corner of the shack. Matthew had the rifle and shooting sticks and was setting up to my left. I ranged the closest antelope at 272 and turned to tell Matthew. The wind had picked up and he didn’t hear me, but estimated the range to be about the 260 yards we had practiced at, and pulled the trigger. By the time I turned back to the antelope I had already heard the “slap” and knew he had hit it. I was surprised however, to see it trotting over the hill away from us. I followed relatively closely behind Matthew, and as we crested the hill, I saw the antelope jump up at about 50 yards and keep moving. It went directly away from us out to about 100 yards, turned broadside and stopped. Bang! Slap! The antelope went down beneath the sage. I thanked God and told Matthew to put another bullet in his rifle and shoot it again if its head was up. This time, I put one in mine as well. The RUM roared and the antelope went down in a heap. Matthew now had to face up to the unpleasant task of his first ever field dressing. It took a while, but he did very well. In the end he was fully initiated by cutting himself before he was done. One band-aid later and the last antelope was in the truck. As we field dressed the antelope, I confirmed that it truly was a Texas heart shot; the round went through the right rear cheek, traversed all the way through and exited at the base of the neck leaving a golf ball sized hole. As expected, everything internally was blown up – leg and hip shattered, tenderloins bruised, guts throughout, and fragments through the heart. Sheesh. I mentally predicted that not much was going to be saved on this one. 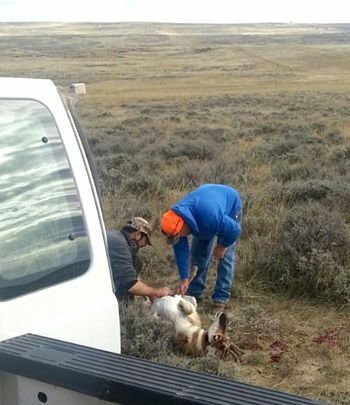 We got the antelope back to the ranch, and the skinning and quartering began. All the animals were in coolers within an hour or so. The brain damaged antelope had no meat damage whatsoever, and the bionic antelope yielded the largest set of horns. Matthew had shot the left rear cheek with his first shot, and went through the right front leg (but missed the vitals) with his second. That combined with the cannon damage yielded a left front leg in addition to the horns. Final round count: Jamison – 1 (winner! ), Roger – 3, Matthew – 3, Pancho – 16. The experience with the boys was great, and they learned a lot, not only about hunting techniques, but also about the real work of field dressing, skinning and quartering. 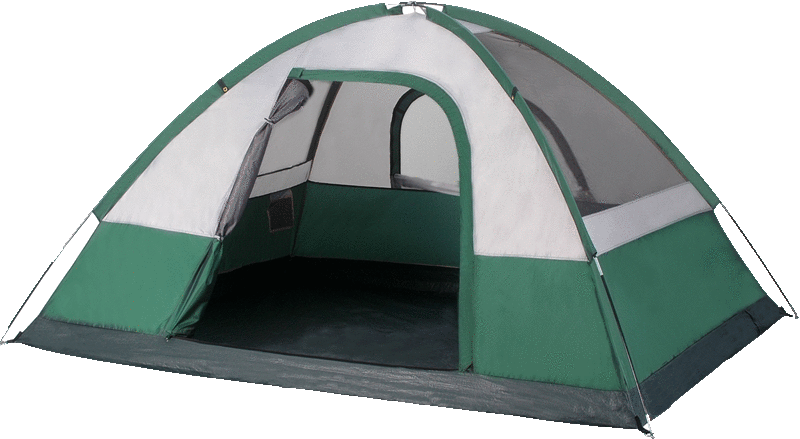 © Honeywell Sportsman Club. All rights reserved. If you enjoyed this story, or found it useful, please consider clicking here to join the NRA at a discount of $15 off the normal membership cost. You will be supporting both this website and adding your voice in support of the Second Amendment. Thank you very much.